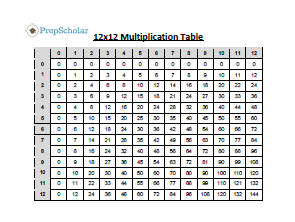 Below is a 12 x 12 multiplication chart showing all multiples of the numbers 0-12. To use this chart, look for the two numbers you want to multiply together on the top row and in the leftmost column, and then find the box that connects these two numbers together. There are many ways you can use this multiplication table to your advantage. If you’re in high school and planning to take the SAT or ACT soon, you can use this chart to help you remember basic multiplication pairs and multiples likely to come up on the SAT or ACT Math sections. Being able to quickly do mental math on tricky problems involving multiplication can effectively reduce the time you spend attempting to solve the problem. This chart will also teach you to avoid relying too much on your calculator on the SAT/ACT Math sections. 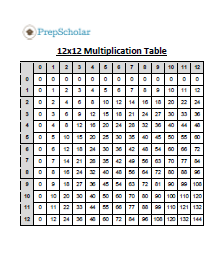 We recommend printing out a copy of this multiplication table and either hanging it up by your desk or study area or placing it in your binder for school so you can refer to it often to help you memorize the most common multiples. 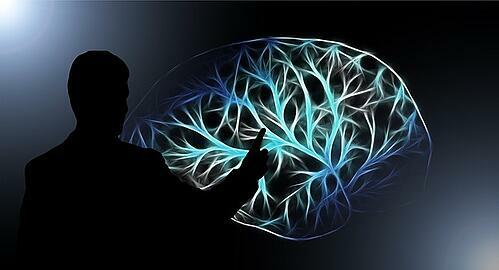 Time to turn on your brain! As you use the multiplication table above, make sure you know all the basic rules for remembering multiples and how they work. Below, we go over the most common multiplication rules you should have memorized. If all you’re doing is multiplying two or more numbers together—and aren’t doing any other math function such as adding, subtracting, or dividing—then the actual order of those numbers doesn’t matter. In other words, 8 x 4 is the same exact problem as 4 x 8 (both equal 32). This rule also works if you’re multiplying more than two numbers together. For example, 2 x 3 x 4 can be written as 2 x 4 x 3, 3 x 4 x 2, etc. Regardless of the order of the numbers being multiplied, this equation will always come out to 24. This means that with the multiplication chart above, you may look for numbers in either the top row or the leftmost column. It doesn’t matter whether you’re connecting the 8 in the top row and the 4 in the left column, or the 8 in the left column and the 4 in the top row. Both ways will give you the same answer of 32. Note, however, that the order does matter when you’re doing more than just multiplying numbers together. For example, if you’re multiplying and adding numbers in a problem, you’ll need to follow the order of operations to solve it correctly. 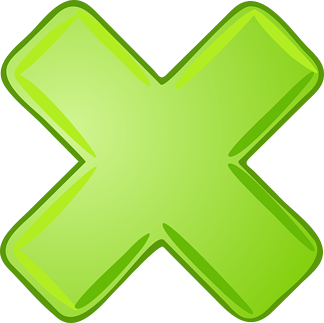 Many people use the acronym PEMDAS (parentheses, exponents, multiplication, division, addition, subtraction) to help them recall the correct order in which they must perform calculations to solve a math problem. An easy way to remember this acronym is with the phrase, "Please excuse my dear Aunt Sally." No matter which even number you choose—whether it’s as low as 2 or as high as 33,809,236—all multiples of even numbers will always be even as well. Don’t believe me? Just look back at the multiplication table above. If you look at the column under 6, for example, you’ll see that all multiples of 6 are, in fact, even numbers! These multiples include 12, 18, 24, 30, 36, etc. A number is even if the digit in the ones place is even (in other words, if it ends in 0, 2, 4, 6, or 8). Unlike Rule 2, all multiples of odd numbers aren’t, in fact, odd! Rather, multiples of odd numbers will always follow an even-odd pattern. As you can see, the multiples of 7, an odd number, follow a clear pattern of even, odd, even, odd, and so on. This pattern works because of a fundamental rule in math: an odd number multiplied by an even number will always be even, but an odd number multiplied by an odd number will always be odd. 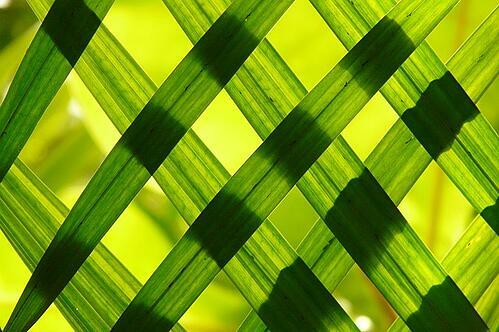 Nature has patterns just like math does. As you likely noticed in the multiplication chart above, any time you multiply 0 by a number—whether that number is 5, 0.0004758, or 6,783,390,391—the product will always equal 0. Basically, since any number times 0 is equal to 0, all multiples of 0 are therefore 0 as well. Whenever a number—no matter how small or big it might be—is multiplied by 1, the answer will be equal to the original number you started with. For example, 9 x 1 = 9. And 12,351 x 1 = 12,351. If you look at the multiplication chart above, you’ll notice that all multiples of 5 end in either a 0 or 5. Knowing this makes it easy to remember what numbers are multiples of 5, even if they’re super high. In short, anything that ends in a 5 or 0 is for sure a multiple of 5. To find a multiple of 10, all you need to do is add a 0 to the end of the number being multiplied by 10. So if you have the problem 10 x 27, you should know right away that the answer is 270 (27 with a 0 added to the end of it). This rule also means that all multiples of 10 end in 0 (this is similar to Rule 6, which states that all multiples of 5 end in either a 5 or 0). In other words, any number you see that ends in a 0, whether it’s 640 or 4,328,120, will be a multiple of 10. Zero can be a very useful number in multiplication. As the multiplication table above shows, all multiples of 11 up to 11 x 9 are equal to the digit being multiplied repeated once. So if you multiply 11 by 6, for example, the answer will be 66 (you just repeat 6—the number being multiplied by 11). Note that this trick only works up to factor 9. Once you hit 10, the product will not equal two repeated digits. Multiples of 12 can be difficult to memorize and a little overwhelming, but there’s an easy trick you can use to quickly find any multiple of 12. All you have to do is multiply the factor (the number being multiplied by 12) by 10, multiply that same factor by 2, and then add these together. This might sound complicated, but it’s really not! Let’s walk through an example. Say you want to find the product of 12 x 9. The quickest way to do this would be to first multiply 9 by 10; this gives us 90. Next, multiply 9 by 2 to get 18. Finally, add together 90 and 18. This gives us 108, which is the answer to our original problem: 12 x 9. 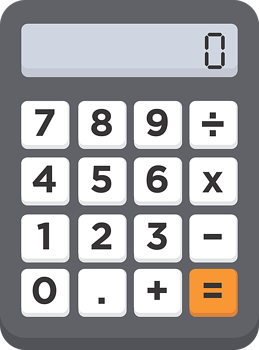 Try this trick with other factors and then double-check your answer with the multiplication chart or a calculator. Want to brush up on other basic math skills? 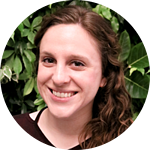 Then check out our expert guides on how to find the mean of a data set (coming soon) and how to use the acceleration formula (coming soon). Need help preparing for the SAT/ACT Math section? Learn everything you need to know about what kinds of topics are tested on SAT Math and ACT Math.